Fiber Flux: Free Crochet Pattern...Earth Fairy Button Cowl! Free Crochet Pattern...Earth Fairy Button Cowl! 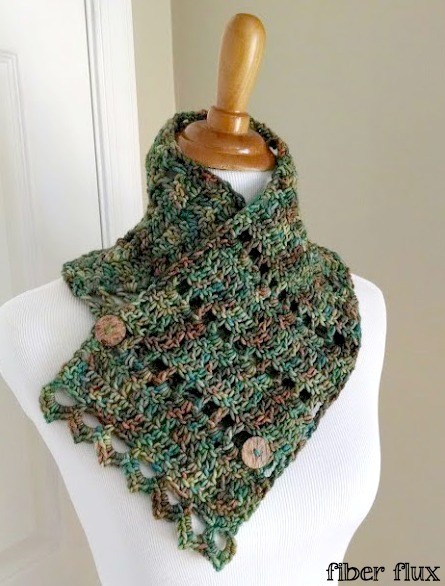 The Earth Fairy Button Cowl is an elegant project that uses a special skein of yarn. Rows of eyelets are finished off with a pretty open picot edging and topped with two lovely buttons. This cowl is versatile and can be worn in lots of different ways, fastening it with one or two of the buttons. No need to work button holes in either, the eyelets and edging work just fine. The Earth Fairy Button Cowl is quick to stitch up, making it a perfect gift idea too! Foundation Row: dc in 4th ch from hook, 1 dc in each ch. Row 1: Ch 3 and turn (counts as dc). dc in 2nd st and in each st across row. Row 2: Ch 3 and turn (counts as dc). dc in 2nd st, ch 2, skip next st, *dc in next st, ch 2, skip next st. Rpt from * to end of row, dc in top stitch of turning chain. Row 3: Ch 3 and turn. 2 dc in first space (ch 2 space from previous row), 2 dc in each ch 2 space across row. 1 dc in top stitch of turning chain. Row 4: Ch 3 and turn (counts as dc). dc in 2nd st and in each st to end of row, 1 dc in top stitch of turning chain. Row 5: Repeat row 4. Repeat rows 2-5 until cowl is 31 inches long or until reaching desired length. Row 1: Ch 1 and turn (counts as sc). Work a sc in the 2nd st and in each st across row. Row 2: Ch 4 and turn, skip next two sts. In the next st, sc and ch 4. Continue in this sequence, working a sc in the last st.
Row 3: Ch 1 and turn. In the first ch 4 space from the previous row, (3 sc, ch 2, 3 sc). Continue across, repeating sequence in each ch 4 space, and also working a sl st at the very end of the row. Fasten off. Thank you for the new print friendly option!!! would also be nice for a print preview so you aren't surprised when it tries to print 11 pages......beautiful scarf,tho! Thanks to you I've got so many stylish cowls plus you've got me crocheting and knitting again!! Print button is much appreciated. Awesome! So glad you like the print button too! what a great pattern. the yarn you used is gorgeous. I LOVE this pattern! I was given some amazingly beautiful Malabrigo Rios yarn as a gift. I want to make a cowl with at least a hat to coordinate. What would you suggest for a pattern? Oh I LOVE Rios!!! Be sure to share on Facebook or Ravelry, I'd love to see it! Gorgeous do you know where I can find that yarn? Look forward to your postings:) Always a surprise! Thanks for sharing! That ... is gorgeous !! I would love to make this for my daughter - and for a close friend - both of whom would adore this mix of colours. Am I right in saying that this particular yarn being hand dyed is 'non repeatable' colour-wise ? Also - I am in Portugal, my daughter is in the UK - and I can't find much of this particular yarn anywhere :( Not even on ebay ! Have you any suggestions that might help? [ I checked out the Yarn Barn - but they didn't seem to have it either ... ] Many thanks for your help ... I will keep looking in the meantime .. and try to find a similar 'mix' of colours ! Thanks, I tried a local shop and found a yarn that was brown/black/brown/dark green - which met with approval from my daugher !! I made it up in two nights !! I have almost finished a second .. in muddy shades of purple/dark green [ will suit my friend SO well - these colours always look great on her!] but it was heavier yarn. I found I had to use less chain to make it narrower and a huge hook. It's a bit heavy .. but it's VERY warm and as she's back in ScotlandI am sure she'll love it !! I love this cowl. Thanks for the pattern. Thanks, and you are so welcome! Thanks for this beautiful, I love it and will probably make it for my sister. I would like to confirm if your please note, note indicates we are not allowed to sell any items made from your patterns is that correct? Beautiful! Just made this in a medium weight single strand yarn. Lo and behold my Toconao Multy #419 arrived in the mail today! BTW your buttons are amazing as well, do you get them locally or online? Thanks for sharing your talent! Thanks for this beautiful pattern. Any chance you will doing a YouTube tutorial on it? I am new to crocheting and find your tutorials VERY helpful. Would love to see a demo of this one as I am a little confused at how Row 2 ends and Row 3 begins and again for end of Row 3 going into Row 4. Would be very grateful for a demo. Cheers. Was there a reply to this comment? I am having the same trouble. Love the pattern and would like to get a few made! Appreciate any feedback I can get! Thanks! I too am having a terrible time trying to make this work. Any ideas?? Was there a reply to these comments, I am having the same trouble!!! Thank you for the beautiful pattern. I am also struggling with the transition from Row 2 to Row 3. I start with 23 stitches in Row 1 which works perfectly for Row 2. My interpretation of Row 3 results in 22 stitches - which does not work for the 2nd round of Row 2 - which needs 23 stitches. what am I doing wrong? in the interim I have added a dc in the 2nd stitch of Row 3. Could someone please share the tip. I am having the same trouble. Thanks so much for this beautiful pattern instruction. I'm making it for my mom. And I'm trying to find a little spring cap that has the same or similar (matching) pattern. I really appreciate your efforts in offering your precious work here. Plz. continue. I'll follow you. I am new to crocheting. However I love your videos. I have been making some of the cowls for Christmas presents. Would you ever possibly make this into a video. I'm not very hood at reading patterns yet. Thank you. I LOVE Fiberflux, I've learned how to crochet beautiful things because of you. The videos and even the written patterns are so clear and easy. I've recommended this site to many. Hope you see a few more blanket patterns. Print friendly puts everything from the page on there....can we just get the pattern please. It is very pretty thanks. I'm having the same problem as the others, my counts go from 23 to 22 between rows 2 and 3. I'm not sure how to fix it. Thanks for your help!